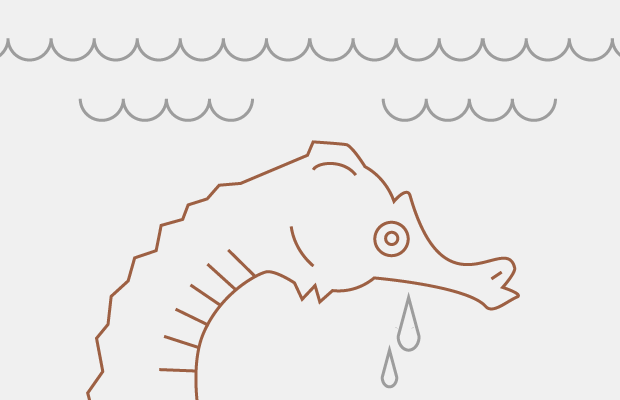 QuestionDo male seahorses suffer from postpartum depression? Hopes&Fears answers questions with the help of people who know what they are talking about. Today, we wondered if male seahorses become despondent after parting with their babes. According to the Anxiety and Depression Association of America, Post Partum Depression (PPD) is depression associated with the aftermath of pregnancy and occurs in 10-15% of all women who experience pregnancy. Currently, there are tests being done on female rodents to see both how hormones and social stresses affect postpartum depression. With women being the typical child bearer, PPD seems to be the sour cherry on top of the sundae of hormones and burdens attributed to birthing offspring. But there is one family in the Animal Kingdom where the men take on the responsibility of carrying the babes, and no it's not Dr. Alex Hesse and Dr. Dianna Reddin (Arnold Schwarzenegger and Emma Thompson’s characters in the film Junior). The Syngnathidae family, which includes animals like seahorses, pipefish, and seadragons, have the unique characteristic of male pregnancy. Some of these males have a brood pouch that the female’s eggs are inserted into while others just attach the eggs to their trunk or tail after the female lays them, yet either way the men are stuck taking care of the brood until they hatch. So if male seahorses experience pregnancy, could they experience postpartum depression in the same way that females do? With recent news of the fish's endangered status, due largely to the illegal sale of dead dried seahorses as trinkets at oceanside shops, we wanted to know more about the nearly mystical creatures. We asked Beth Firchau, who has been the Curator of Fishes and the Dive Supervisor at the Virginia Aquarium and Marine Science Center for over 20 years, to provide her insight on the subject. As fascinating as the reproductive life of seahorses is, there has been little science devoted to the emotional or mental state of these fishes, and no research on seahorses pre- or postpartum. Considering what we know of biochemical changes that occur in higher vertebrate brains after giving birth and during PPD, it would seem logical to explore hormone and cortisol levels in reproductive and non-reproductive seahorses as a first step. This has not be researched to date and so from a biochemical standpoint, we just don’t know. If we consider postpartum depression as it relates to parental investment in humans, it can be argued that if mothers, or now we are learning, fathers, feel that they do not have the support network or ability to raise a child, they may be prone to PPD, thinking they cannot succeed at the task at hand or their situation is not conducive to success. Unlike other species, male seahorses give birth to several hundreds of fry in one brood and are ready to mate and conceive again in as little as 24 hours. As is common in the fish world, parental care of young is not present in seahorses. Fry, sometimes less than .5cm in length, are birthed from the male’s pouch and set upon the ocean’s currents to find their own way. The investment needed to raise young [or] the ability to perform the task at hand is not present when parental care is not provided. It could be argued then, that male seahorses probably do not exhibit postpartum depression or, at the very least, are not prone to it. If you settled on an average of 15% of four million live births in the US annually, this would mean approximately 600,000 women get PPD each year in the United States alone. Only 15% of women with postpartum depression ever receive professional treatment. This means about 850,000 women each year are not getting help. Maternal depression during infancy has a bigger impact on a child’s development than later exposure to maternal mental illness (Essex 2001, Moehler 2006). The female meets the male in his territory and as they approach each other, THEY CHANGE COLOR. The male circles around the female and the pair often spiral around an object. This display can last for up to an hour. Once over the female goes back to her territory. The seahorse is the only creature where the male has a true reversed pregnancy. The female transfers her eggs to the male which he self-fertilisers in his pouch. The number of eggs can vary from 50-150 for smaller species to 1500 for larger species. They receive everything they need in the pouch from oxygen to food. Gestation time varies from 14 DAYS TO 4 WEEKS. Giving birth can be a long process with contractions lasting up to 12 hours.